Lets get everyone to do a roll call…. Holiday check in! My mom is dying… lung cancer/emphysema. I’m missing my MWC friends… particularly Susan. Her passing took all the air from my sails. 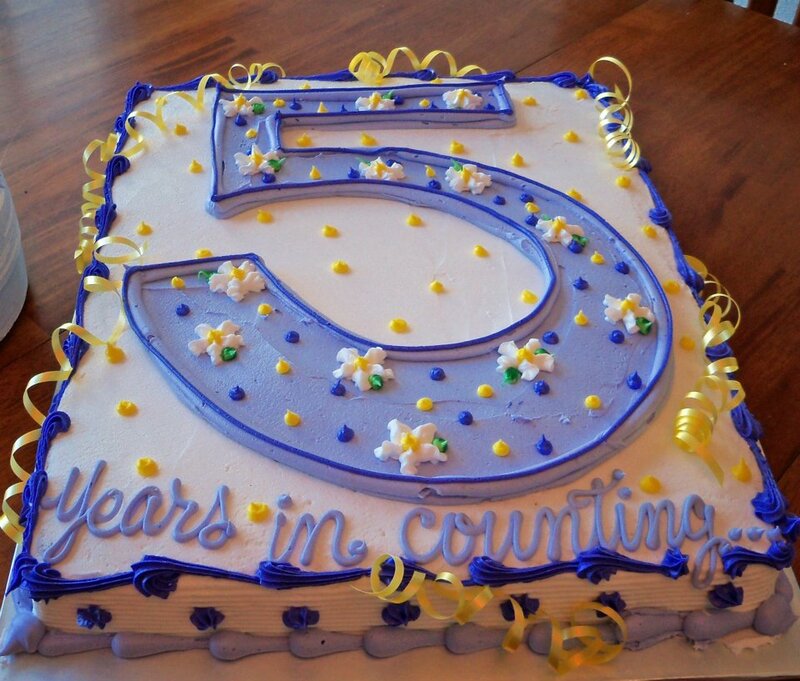 In October 2011 I reached the 5 year mark. Cancer-free for five fabulous years! They certainly weren’t five worry-free years, by a long shot! Early last year my blood work started showing some changes. My Alkaline phosphatase levels were fluctuating. They would go higher than normal, at my next appointment would drop back to nearly normal again, only to raise fairly drastically the next go round. Very much like a roller coaster – a very not-fun roller coaster where I worried about liver or bone metastasis. Of course, I got my very permanent, very meaningful 5-year tattoo in October anyway because I’m very, very stubborn like that. So, this morning I had my 3 month follow-up appointment with my wonderful Oncologist, Dr. Villa. She’s wonderful! Incredible! Awesome! I fully and completely credit her (and God, of course) with saving my life. I’ve even forgiven her for scaring the bejeebus out of me when I asked her what my recurrence risk was way back when in May of 2006. She didn’t even blink an eye when she said, “90%”. Jeez! You could sugar coat it a little, Lady! Anyway, back to the appointment. I’ve been very glad to have one coming up since I’d developed some sensitivity in some of my lymph node areas. I’ve been losing sleep over it. At least I think that’s what has been disrupting my night-time routine. Maybe I’ve been worried. Maybe a little bit. Maybe. So, imagine my surprise when she walked in to the exam room and told me that she was going to consider me cured. Wha? Huh? Did I miss something? Yeah, you heard me right! The other “C” word. Cured, as in, gone. No more cancer. Not ever. So she explained herself. First off, my rogue Alk Phos levels have returned to normal. In fact, my labs are “perfect”. <Insert pride and preening here> Then there’s those odds… the 90%… Turns out most of those turn out to recur in the first 18 months. Particularly the Triple Negative Inflammatory Breast Cancer patients, like me. However, turns out that a small percentage of Triple Negatives have cancers that are particularly susceptible to chemo. Women with this small percentage of Triple Negative cancer who manage to make it to the three, four and five-year marks also tend to never recur. Never. Joyous of all words, that “never”. So here I sit with 5 years and 3 months of cancer-freedom under my belt and a new “C” word behind my name. To say I was shocked by Judy’s passing would be a gross understatement. Yet, I guess, I knew it was coming. I just thought she had a few more months. Judy was special to me. She was my first… the first person with Inflammatory Breast Cancer I’d ever encountered. I remember well how it felt to find posts from IBC survivors that were years old with no updates available. I thought to myself how wonderful it was that they’d survived X number of years… but where were they now? Alive? Dead? It turned the potentially hopeful, inspiring stories into landmines of doubt and fear. At that time, I vowed to be an active, living voice of an IBC survivor on the internet. Enter Judy. I found Judy’s blog after I’d returned to work from my own cancer treatment. She had just been diagnosed. She was already metastatic. I made a concerted effort to comment on her blog. Hoisting myself as a flag of hope at the finish line of treatment: cancer-freedom. Of course, that was naive of me. I had little understanding of metastatic disease back then. But still, I made sure I was that living, breathing voice of survival from such a deadly disease. Through Just Enjoy Him I found other Inflammatory Breast Cancer patients, notably, Susan (WhyMommy). Seems we all had the same supportive idea. Judy was the beginning of my advocacy. She was my window into the dark side of breast cancer. She was my first reality check… the first time I realized that attitude and strength of will were not the impenetrable armor against cancer that the media would have me believe. Following Judy has not always been pretty. She struggled with anger and fear that I never truly experienced. But inevitably, her faith in God lifted her up again. She lived a roller coaster ride of plunging health and spirits followed by glorious soaring heights. That is life. That was Judy. That is metastatic cancer. I will miss her voice. I will miss here spirit. I will miss her face smiling back at me from my monitor. I will miss her planking. Heh. I will miss Judy. But I’ll see her again someday. What a glorious day that will be. Two nights ago I logged on to Facebook to find that our own Judy of Just Enjoy Him had entered hospice care. Barely an hour later she was gone. Judy was, tragically, already metastatic when she was diagnosed with Inflammatory Breast Cancer in 2007. She fought this horribly aggressive cancer for 4 years with grace, humor and a double dose of faith that we could all hope to attain. Judy’s tale wasn’t always pretty but it was unfailingly honest. She has left behind her husband, Frank and their 10 year old adopted son, Nate. Please keep them in your prayers at this difficult time. Please feel free to leave your memories of Judy, favorite stories and words in the comments below. I’m sure her husband and son will take comfort in them. I know I will. Hey, Everyone! It’s been a while since I’ve logged on here. That’s good news because if I was having active cancer issues I’d be on here daily. So, I’m here today to share some great news. Last week I hit my 5 Year Survivor mark! What a milestone! I do feel blessed to be here, in this place, standing in the sunlight of cancer-freedom! The odds were against me being here. Inflammatory Breast Cancer (IBC) is not a kind and gentle cancer. The odds moving forward aren’t really much better but I’m confident in my ability to survive again! Five years ago I was given a 90% lifetime risk of recurrence. I don’t think that has really changed after 5 years (but I’ll be sure to asked my Oncologist when I see her next!). Unlike other breast cancers where recurrence drops dramatically after the 5 year mark (75% of recurrence occurs in those first 5 years), IBC does not. Depending on which study you read, the overall percentage of women who reach 5 years survival is somewhere between 52% and 56%. That is not necessarily Disease Free Survival (DSF) like mine. These figures include people like our own WhyMommy who are living with metastatic disease (Metavivors), but living nonetheless. Still, in the not-so-distant past women with IBC survived only an average of 18 months after diagnosis. We’ve come a long way, Baby! Yet there is still so far to go… Survival rates for Inflammatory Breast Cancer at 5 years is roughly 54% (I’ll split the difference in the studies). 10 year survival rates are 35% and drops to 28% at 15 years. Staggering! Only 28 of every 100 Inflammatory Breast Cancer patients will live 15 years beyond their diagnosis. These are horrible figures for a young woman’s disease! On to better news… I celebrated my AWESOME MILESTONE with a big party and a tattoo to commemorate! 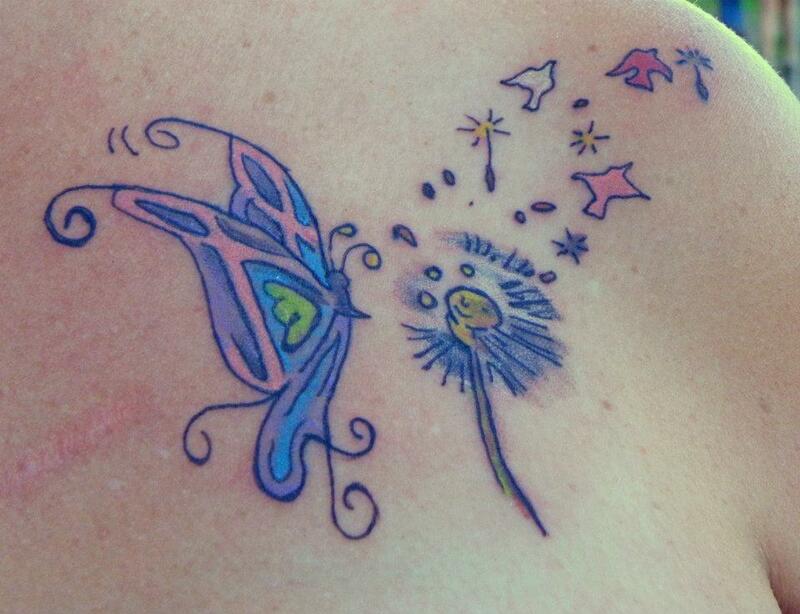 The pink ribboned butterfly represents my metamorphosis from cancer patient to cancer survivor. The dandelion holds the wishes for my cancer sisters’ complete recoveries. The floating dandelion seeds are for each of my years of survival (there are supposed to be 5 but I need it touched up). The white (pearl) bird is for my Grammy who recently died of lung cancer. The fuchsia one is for Andrea (Punk Rock Mommy) – my first IBC loss. And the pink bird is for Sarah of Sprucehill whose passing hit me so very hard. I hope to add many, many more floating seeds over the years and no more birds. Ever. More news: I’ve added a link on the HELP page for a Care Calendar. My gf is using it for meal sign ups. It’s easy peasy and it’s FREE!